Queelister's Place: Lady - bugs! It's time for Faith's progressive challenge over at Delightful Inspiration. This week we were given this digi set named Catch the bug, so cute. The Beary Scrap is contuning with with their Birthday Bash and the theme until March 31, is Spring. The sketch is from Doodle Pantry Challenge #10 and over at DYSU it's about shine. This card will also be entered into Paper Sundaes Embossing challenge. Sweet card, I like the way you put on the rhinestones. Thanks for shining in our SHINE ON challenge at DYSU this week. Good luck in the draw! Gorgeous! Oh I just love love it! The whole layout is fantastic! Very beautiful card! Thanks for joining us at Designed 2 Delight this week. Such a cute card, I love your bug jar. Thanks for joining our Beary Sweet Challenge, good luck winning one of our Birthday Presents! Beautiful! That jar looks like real glass, and those flowers are gorgeous! Great job! 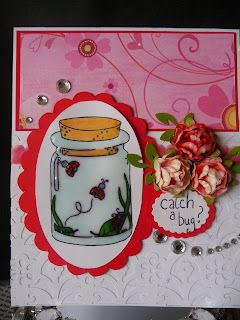 Great card, love the shine on the jar. Your flowers are wonderful. Thanks for joining us at Doodle Pantry for our sketch challenge. So cute! I’m so glad you joined us this week at DYSU! I love getting to check out all these new blogs! What a great take on the Doodle Pantry sketch. Gorgeous card. Thanks so much for joining on for DPBC10. Wonderful take on the sketch, so cute and so nicely done! Thanks for joining us at the Doodle Pantry challenge this week. What a cute card! Thanks so much for joining us at the Beary Scrap Spring challenge. Very nice! Thanks for playing along with us at Doodle Pantry Digital Challenge 10! Oh what a cute image! This card is a wonderful take on the sketch. Love it. Thanks for playing along with us at Doodle Pantry!